Simply put, ore sorting is the process of separating mineral particles into ‘the ones you want and ones you don’t’. The process of mineral sorting has been around for centuries. Traditionally precious stones, copper, iron, and other minerals have been sorted by hand. But sorting ore by hand is extremely labour intensive, not to mention costly. However, Ore Sorting Australia is evolving processing technologies by introducing new mining technology to the Australian market to solve these issues. We are at the forefront of the mineral processing industry and have successfully helped mining and quarrying companies alike to reduce their project expenses. Our Ore Sorting units available for immediate wet or dry hire are fully self-contained and can be mobilised to any site around the country, making them the ideal solution for remote mine sites. 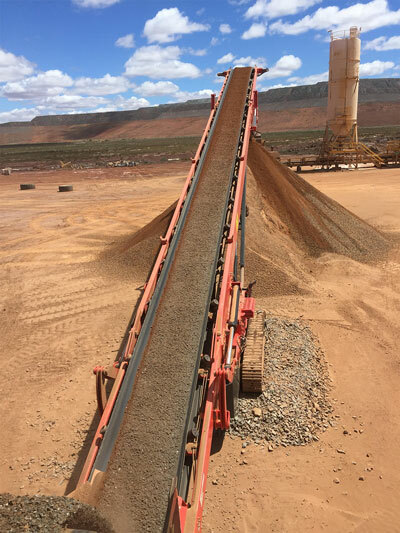 These state-of-the-art Ore Sorters can upgrade low-grade stockpiles to make them economical, ultimately reducing mine and quarry operational costs. What Ores can our Units Sort? We provide OSA ISS X-Ray Combination Ore Sorting Units for hire throughout Australia. Our leading ore processing plant can sort a wide variety of minerals including Manganese, Hematite, Magnetite, Nickle, Coal, Feldspar, Silver, Lead, Zinc, Diamonds, Gold and more. Our head office is in Kalgoorlie, Western Australia and we can shift our gear throughout Australia. You’ll often find the Ore Sorting Australia team working at sites around the Bowen Basin, Surat Basin, Mt Isa, Cloncurry, the Hunter Valley Region, Goldfields, the Pilbara region, Whyalla and more. If you’d like any additional information on Ore Sorting or how we might be able to help your next mining or quarrying operation – call us today. Our team is always happy to have a chat about your project's requirements.